I never realized how often I touch babies’ toes, or how often everyone touches babies’ toes, until everytime it happens I am reminded that he cannot feel it. That certainly doesn’t stop us from touching his toes constantly, it’s just weird to imagine what it feels like to NOT feel them. Obviously it is all Colten will ever know so its not weird to him. I guess it would be like… Hair. Don’t laugh! Seriously. I have hair but I don’t feel my hair. I can’t control my hair. I can feel where it connects to my scalp and I can move it by moving my head but I cannot independently feel my hair or make it move. Totally not the point of this post, but I was trying to think of something we all have that we can’t feel or move. That’s the best I could come up with! 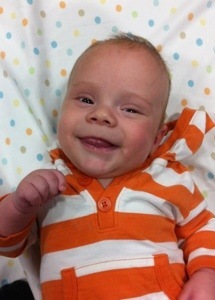 Today Colten had to get his newborn screen redrawn. They do this so many hours after birth and I guess Sparrow Hospital drew it too soon. It is a blood draw via heel prick that tests for various rare but serious disorders. I don’t expect anything to come of the test but the interesting part was the heel prick process itself. We went to the lab this morning and the phlebotomist put a warm pack on Colten’s foot to help draw the blood down and open the capillaries. Thinking I was all smart and not wanting him to get all riled up, I had her do the right foot. He didn’t even wince when she poked him. Yay! Then she struggled to get enough blood for just the first of five dots. I couldn’t figure out what the issue was, thinking it was her, then I rembered a conversation with another mom of a girl with Spina Bifida recently, and remembered the lack of proper blood flow these kids have. I mentioned to the lady that he didn’t have any sensation in his feet and didn’t have good blood flow down there, but might have slightly better “stuff” on the left side. So after a few minutes of not getting anything else on the right, she warmed up the left. It still took another 10-15 minutes to get enough blood to completely fill the circles on the card. I really expected this to be straightforward, and it’s not like it was a big procedure or anything but I had hoped to be in and out more quickly than I was. Then I realized that all my reasons for thinking this would be easy were the exact reasons it was difficult! Great that he can’t feel much there but it meant not enough blood flow. Great that he can’t feel much there but that also meant he didn’t feel the prick or squeezing, so he didn’t flare up and cry like I recall my other boys doing, getting his blood flowing. So we continue to learn even the littlest tips on life with this little man. 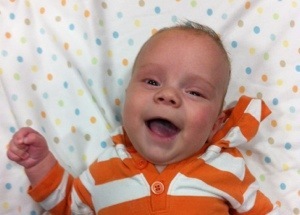 Colten is finally over his cold and is a pretty happy little man. He loves being worn close to Momma and Daddy, gets big smiles when big bro Parker smiles at him, and hears “Cuuute” from Max about 20 times a day. This entry was tagged myelomeningocele, spina bifida. Bookmark the permalink. Wow. Is Colten ever growing bigger so fast. I haven’t seen apicture in about a month and he sure has changed. Looks so healthy and happy!! Merry Christmas to all your family!